The week saw some pretty wild action that told us markets and stocks were going to correct, but that was short-lived and now we are back on track for higher prices into years end. It was a blessing in disguise as we locked some gains and some losses and had the chance to reset and enter even better stocks who I’ve been trying to get into but was waiting for proper buy points to come, and come they did mid-week. There is no doubt, it has been a tough year with many stocks only running a small amount from the buy points. Stocks just haven’t really run with any conviction for any real amount of time. All we can do is take the market we’ve got though and we’ve done fine, but I always want to do better. Hopefully the end of 2014 and 2015 will see better action. As for the metals, they were quite wild and giving no direction until Friday, and that is now pointing to lower prices again. Gold gained 2.30% this past week and saw very wild action early in the week. In the end, gold still can’t get above the resistance area at $1,220. 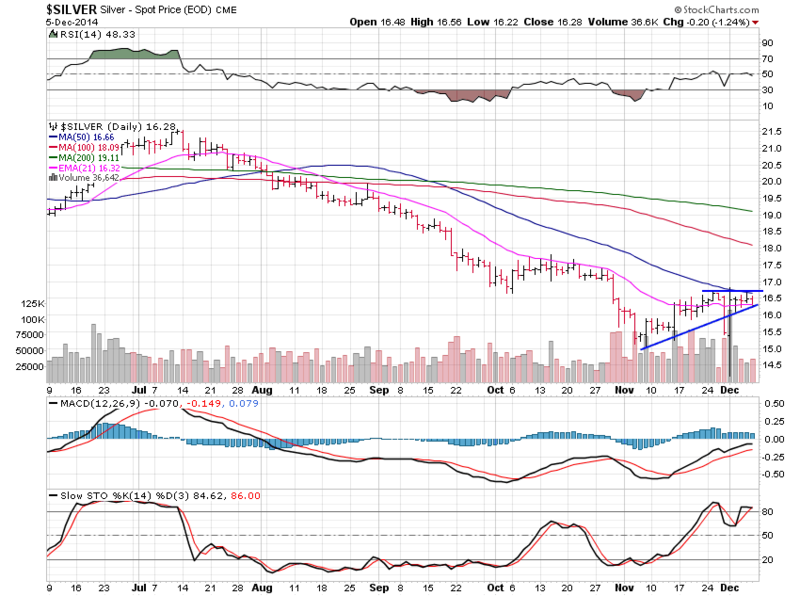 Triangles are continuation patterns and the dominant trend in gold remains down. 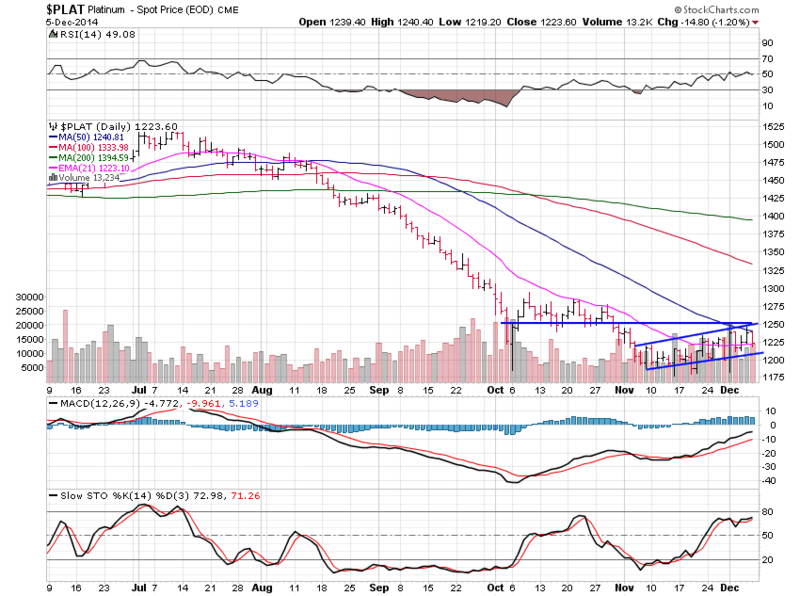 I warned subscribers Thursday evening that this was the case and gold did begin to break this pattern lower. I’m all out of our gold related positions and it looks like we are going lower now once again. A break above $1,220 would change that to we will go higher. 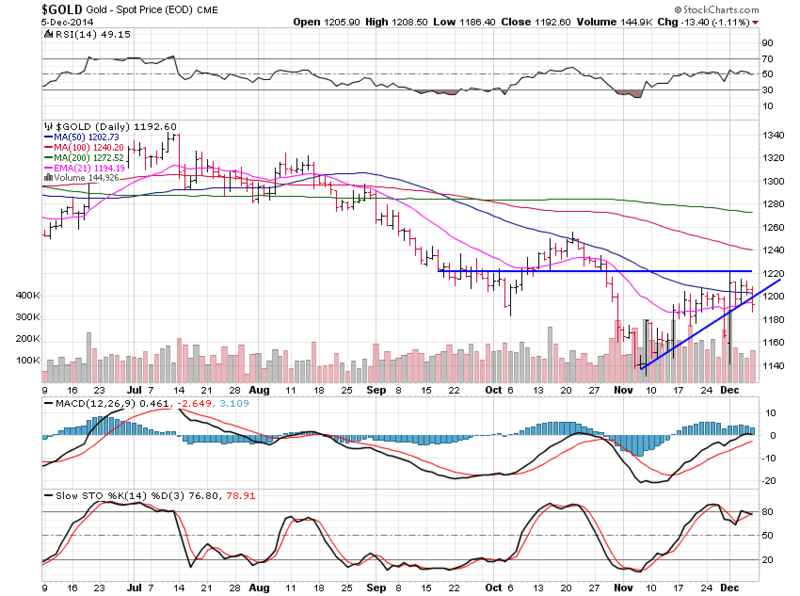 Support sits at $1,180 still, and now there is also some support at $1,160. I did think gold put in a relatively important low in early November but now that we’ve had some time to see what forms on the chart it does look like the long slow march to $1,000 is resuming. Silver gained 5.27% for the week but the large gain isn’t really a gain considering the holiday shortened trading the previous Friday which saw silver slammed. Silver now looks ready to head under the $16.30 area, and back to test $15. I’ve talked about the $10 level as being the major support level in silver and that is now in play. I’d rather have seen silver hit $15 while gold hit $1,000 since they correlate so much and those levels are major, major support but it is not to be. Silver will see its major support at $10 while at the same time gold tests it’s major support at $1,000. Platinum lost 1.97% this past week and as always, it will now head lower following gold and silver. Platinum could not muster the base to move past resistance at $1,250 and with gold and silver now set to break lower, platinum will follow. Major support for platinum is $900 but $1,00 does have a minor support level. One of the keys to successful trading is being adaptable and able to change your view quickly and that is what I’ve done here. I was looking for a much longer bounce in the metals but it’s never up to me. 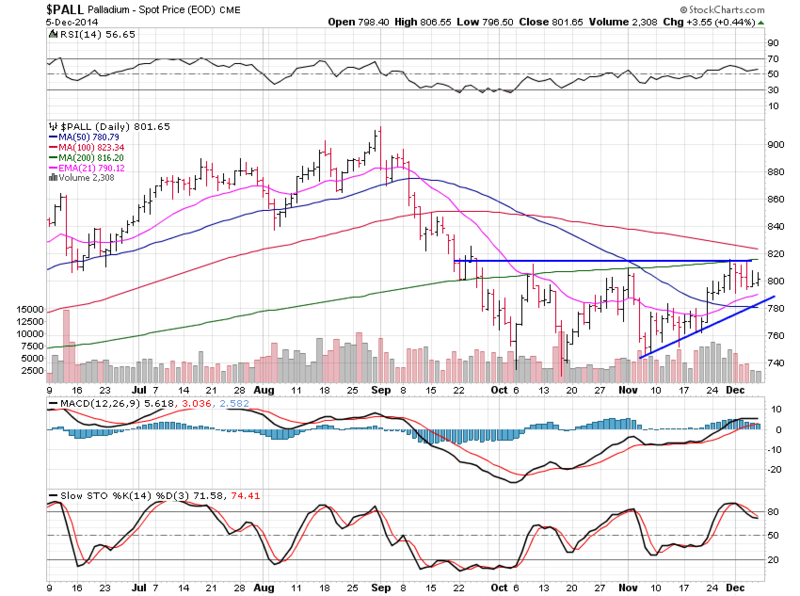 Palladium lost 0.95% for the week and should also follow, and move lower shortly. A break of the uptrend line at $790 or so would be the area to look for the move lower to accelerate. Some support sits at $760 and $740 on this chart. I wish I had better news and that the metals were set to continue higher from here but it isn’t so. I’m sure I’ll hear from many as always telling me how wrong I am and that will help further validate what the chart is telling me. I may well be wrong, but that is what I am taking from the charts this weekend.